One of the reasons I was intrigued by this film is that I’ve always had a fascination with horses. I was horse mad as a young girl, I think most girls are but I don’t think I ever really grew out of it. I’ve read about wild mustangs. Living in Arizona, wild mustangs are more prevalent here and in recent years, there have been attempts to rescue them and prevent them from being rounded up. This film, since it featured these beautiful animals and what happens to some of them once they are rounded up by the federal government was especially interesting to me. Even more, it features the use of the horses in rehabilitating prisoners. This film is all about second chances, both for the horses and for the prisoners. I found it compelling, emotional, and transformative. 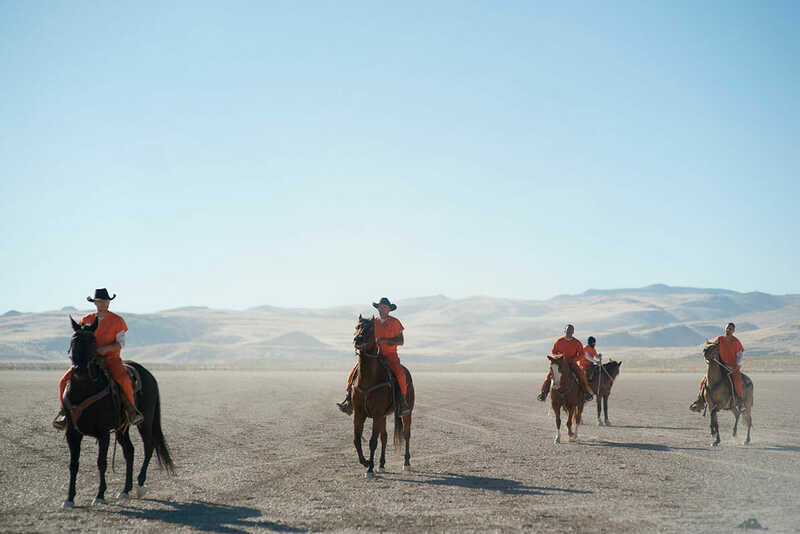 Written and directed by Laure de Clermont-Tonnerre, The Mustang tells the story of Roman Coleman (Matthias Schoenaerts), a convict in a rural Nevada prison who is mandated to “outdoor maintenance” as part of his state-mandated social rehabilitation. 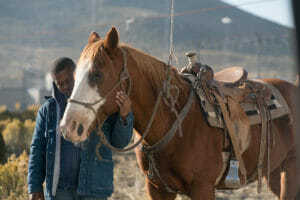 Picked by a no-nonsense veteran trainer, Myles (Bruce Dern) and helped by fellow inmate and trick rider Henry (Jason Mitchell), Roman is accepted into the selective wild horse training portion of the program. Once there, working with his wild horse, he slowly transforms, regaining his humanity while gentling the especially unbreakable mustang. This is an extremely layered film. The writing plays back and forth between Roman and the Mustang, allowing the viewer to see the parallels between the pair right from the beginning. It also allows the viewer to understand that we get Roman’s story in conjunction with the horse. As the story begins, Roman is angry, a violent offender who is closed off and unresponsive to others. He is withdrawn and has been in isolation. As he is introduced to Marcus, you see his slow transformation, opening up bit by bit as he works with the Mustang. As he learns control, over his emotions and his behavior, so too does the horse open up to him. The first act is told in silent moments and in visual cues, as Roman watches and learns. By the end of the film, the contrast in his emotions, his openness is striking. As Roman emerges from his shell, he is visited by his daughter, Martha (Gideon Adlon) who he hasn’t seen in years. At first, she is only there to have him sign paperwork so she can be free of him. But as he emerges emotionally with the horse, building a relationship with the Mustang, he also rebuilds a relationship with Martha. Rediscovering his emotions, taking anger management courses with the prison psychologist (Connie Britton), he is able to open up with Martha, showing remorse for his actions and allowing her to begin opening up to him in turn. As with the writing, the creators have made very deliberate choices with the filming as well. 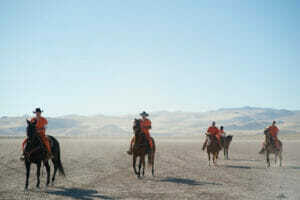 The beginning of the film presents the wild mustangs first, in all their untamed beauty and then intersects to Roman in isolation, illustrating the comparison between the two. Visually, there are some stunning scenes. I especially love the moments between Roman and the horse, as Marcus warms up to Roman, each gentling the other. The final scene is striking, emotional and heart-wrenching. I love the spotlight, both on the rehabilitation program, allowing prisoners the opportunity to reform themselves, to change. One of the ending notes explains that prisoners who have been in one of the wild mustang training programs are less likely to re-offend. Not only does it spotlight how positive this is for the prisoners but it also highlights how important this is for the Mustangs as well. 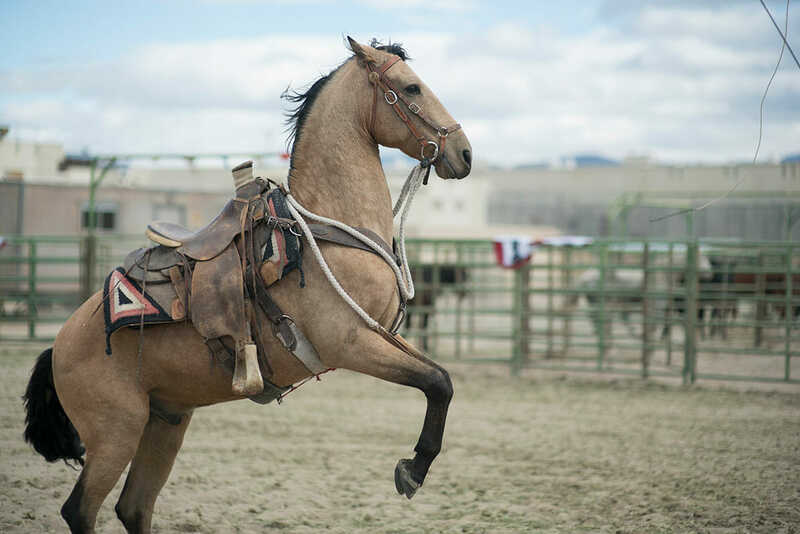 Without their training, these horses would end up euthanized or caged. So for both prisoners and animals, this allows them another chance. This is not done in any preachy way but simply by illustrating through the film the emotional changes wrought in both Roman and the Mustang. There are some stellar performances in this movie. Matthias Schoenaerts is the focus of the film so his performance absolutely is integral to the film’s success. He is incredible, his portrayal nuanced and emotional, subtly transforming from a silent withdrawn man to open, emotional, and controlled. It is persuasive and compelling. Yet, the secondary performances are equally skilled. 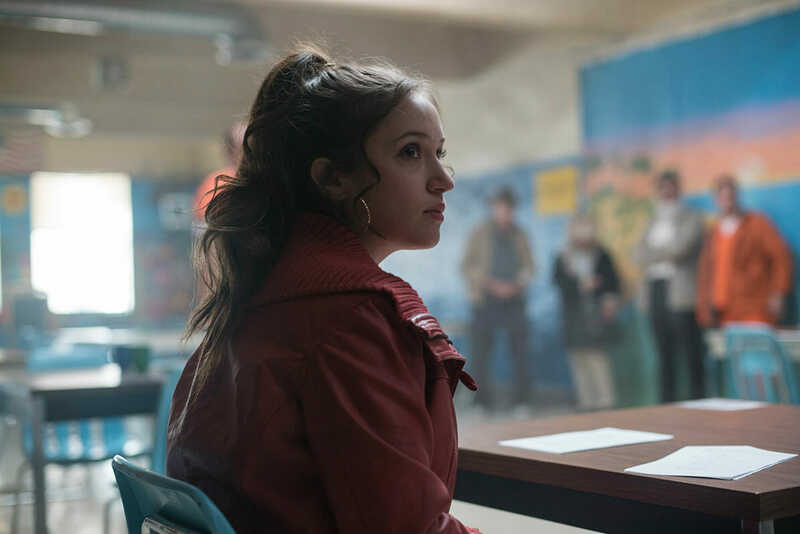 Gideon Adlon as Martha gives her character a voice, as she demonstrates Martha’s pain over her father’s choices but her willingness to listen is part of what makes the story engrossing. Bruce Dern is brilliant as Myles, playing his character as blunt, but seeing potential in the men he works with. Jason Mitchell is bright and adds some necessary humor to this drama, his personality contrast to Roman’s, showing us the potential for Roman to change. Even though this is one of the best films I’ve seen and I absolutely love the story as well as learning about the rehabilitation program, it isn’t perfect. There are some few details that I noticed in the filming. One of the first is that I don’t know exactly where the prison is located until halfway through the film. We also don’t get the clarification of who Martha is until her second visit. We know she is important but not why. While I believe some of that is deliberate to illustrate Roman’s embrace of his humanity, it does slow down the film’s pacing and made for some small confusion. Overall, it does not detract much from the quality of the movie. While I feel this isn’t going to have the mass market appeal of other films, because it is such a focused subject matter, I feel it deserves to have more attention paid to it. 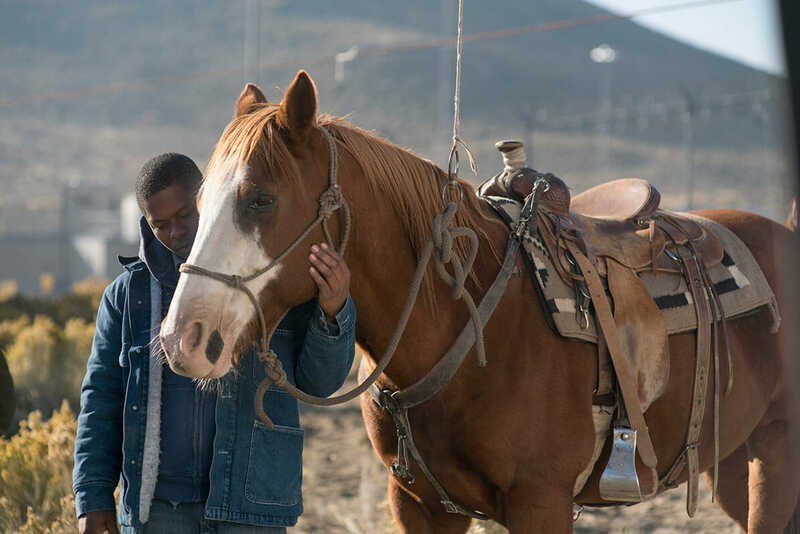 It is an engrossing, engaging film, spotlighting both wild mustangs and their plight as well as how they can be used to rehabilitate violent offenders so they can lead more productive lives. I feel those who love horses and those who love quality film will truly love this movie. I really feel this movie deserves a chance to show audiences how programs like this one give second chances for both prisoners and mustangs. Even if this isn’t your normal fare, see it for the beauty of the horses and the emotional performances. Rating: 4.5 Mustangs out of 5.